We are on holiday 15-29.7! Protoparts Oy - Who are we? We sell products worldwide to private persons and businesses. Prices shown in shop is included Finnish VAT 24% (Exception: some unique custom products, when it is separately mentioned). Right for price changes and delivery costs/methods are reserved for us. NOTE! Customers outside EU: You don´t have to pay VAT, price is corrected at checkout procedure, when you have given your country! Ordering is processed by clicking product(s) to shopping cart and making paymentprocess in given methods (Klarna Checkout, Paypal). All personal information is considered confidential and it is only used in processing the order and contacting consernig the order(s), unless it is separately mentioned. When placing an order, it is then assumed that you have read and understood all terms and conditions and you are accepting those current terms. 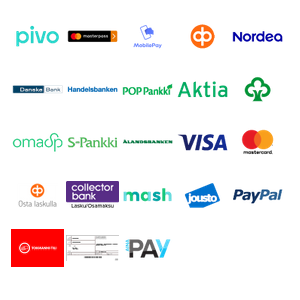 By giving your information at checkout, you accept Klarna AB:s (Klarna AB, Sveavägen 46, 111 34 Stockholm) terms and conditions. By pressing "Buy now" -buttona, you will accept also Protoparts terms and conditions. When we have received an order, we immediately send confirmation to you, which includes your order information. ALWAYS CHECK content of order confirmation and please make immediate contact to us, if you find something is wrong or you have questions. Save the confirmation if you come in need to contact us. When contacting, pleas tell us your Name, customer number (if available) and number of order. And when receiving delivery, please make sure that contents match with confirmation and receipt/invoice. Delivery costs includs postage and packin expenses. We show approximate sum of delivery costs in our webshop, which is via our reference method. Actual costs is found when you place and order and choose your preferred payment- and delivery method. Available methods are depending on product, weight, measures and receivers country. Shop only shows methods, which are possible for that current order. Our current logistic partners are Finnish post "Posti" (International delivery also) and matkahuolto (Only in Finland). Maximum single package weight is 30kgs, after that it is special Multi package delivery and we contact for delivery price. If your delivery address is outside of EU, you may have to pay import duties and taxes, which are assigned once a shipment reaches your country. You must meet any additional charges for customs clearance. Please note customs policies vary widely from country to country. We recommend you contact your local customs office for further information. International shipments may be subject to cross-border inspections by customs authorities. We are not responsible for customs declaration fees. Customer outside EU can order Tax Free from us, Checkout will automatically reduce Finnish VAT off, so price will be 24% cheaper, than price, which includes VAT. Note that we cannot change the value of shipments in order to reduce customs duties. The modification of commercial invoice is brobhited by law and we kindly ask understanding: Please do not ask us to reduce shipping value. We will not do it. Our most common delivery time inside Finland is approx 2-3 days from order, inside europe about a week, depending on Postal service. Mainly, stocked and ready items will be sent as soon as possible, about 24h from order. Ununusual delivery time is mentioned in product specs and if there is some delay from some reason, we will contact you via Email. Please note: Ready Megasquirt ECUs and wiring harnesses almost every time needs some customization, so these are delivered within a week from order. Our expert will contact in this case. Unpaying or no picking up delivery is NOT considered as legal return or cancellation. In this case we hold right to ask you for payment for delivery cost IN BOTH DIRECTIONS. Invoice is sent to receiver. If delivery is lost or damaged in transit or somehow it is not what you expected, please meke contact. In that case, contact MUST be made within 14 days from receiving it. Contact must be made with email or letter. If the package is clearly damaged in transit, receiver must make an reservation/claim to transit company you have chosen to deliver.